New Horizons Dublin is an authorised testing centre for leading certification testing vendors including Pearson Vue and Certiport. To schedule an exam please see the instructions below for each testing provider. How do I book an exam at New Horizons Ireland? New Horizons Ireland is an authorised testing centre for leading certification testing vendors including Pearson Vue, Certiport, PSI and Webassessor. Pearson Vue administers certification exams offered by most major IT vendors including Microsoft, CompTIA, Cisco, and Citrix. What is the cost/price of the exam? What hours our the Exam centre open? What ID do I need for exams? Most exams requires two forms of identification, some of them only one. *Primary ID without a signature: Some government issued ID such as a passport, driver’s licence, military ID or state/country card may be a biometric type and/or may not contain a signature. In these cases Primary ID will be accepted without a signature on condition that you also present a Secondary ID which does contain your signature (e.g. bank, credit or debit card). What items can I bring into the exam room? You are not allowed to bring any personal belongings into the exam room. You must remove your watch and phone as these items are not allowed in the exam room. We provide lockers to keep your items safe, such as wallets, watches, mobile phone, water bottles etc. We can provide erasable note boards and pens for use int he exam room. We can also provide earplugs or noise cancelling headphones. For more details you must check the email that you got when you booked your exam. Can I start my exam if I arrive late? No, you can’t. Exceptions might apply according to your exam, you must check with Pearson Vue for more details or with the vendor of your exam. Can I go to the bathroom during my exam? Yes, you can. You must raise your hand to signalise for the proctor that you need something. Some exams have scheduled breaks, so in this case your exam will pause, and you can proceed to your break. However, most exams do not have a scheduled break, in this case your allowed exam time may still be counting down while you go to the bathroom. I didn’t get my results yet, what should I do? You should contact Pearson Vue with your registration number to get more information about it. New Horizons Ireland can NOT access candidates’ personal information about scores or results. I want to reschedule my exam, what should I do? All exam providers have different rules for rescheduling. Please contact your exam provider directly to reschedule. To reschedule a Pearson Vue exam, you should first log into your Pearson Vue account and select the option to reschedule, if available. If you can’t reschedule your exam by logging into vue.com, you should call Pearson Vue directly on 1800 552 131 (Free from landline only). I want to cancel my exam, what should I do? You will need to contact your exam provider immediately. There are different cancelation rules for each exam and exam provider. How do I book a PRINCE2 Exam? How do I book an ITIL Exam? How do I book a Project Management Professional (PMP) Exam? Do you host GMAT exams? Yes, we do host GMAT exams at our Test Centre. You can register or book GMAT exams at https://www.mba.com/. Do you host UCAT (UKCAT) exams? Yes, we do host UCAT exams at our Test Centre. You can register or book UCAT exams at: https://www.ucat.ac.uk/ucat/. How can I book a CompTIA exam? How can I book an AWS exam? I was just wondering what the admin costs would be for sitting an ecollege exam at your centre? You can book trough eCollege, your tutor can help you. If you have your own voucher than you will have to pay €30 Administration fee. Call 01 8898708. Or you can purchase the voucher from us for €120.00 (including admin fee). Call 01 8898708. Where is New Horizons Ireland Located? 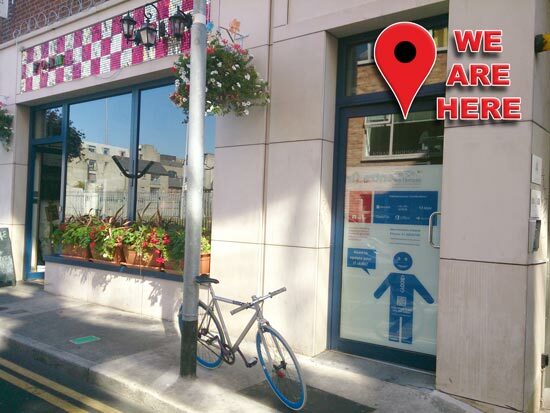 We are located just opposite the national hyperbaric chamber on Strand Street Great, just off the Millenium Walkway. Ring the buzzer on the glass door to gain access. Exam proctoring service and invigilator service is available at our Dublin 1 office.